Shepherd loved this pale green silk jacket by Tim Harding so much that she later bought another in iridescent fall colors. This delicate Jes Irie jacket of champagne bias lace, with frilly black trim, is suitable for even formal occasions. This cheerful green jacket with embroidered sunflowers by Mary Lynn O’Shea is one of Shepherd’s current favorites. O’Shea’s jacquard fabrics are all woven especially for her Vermont studio. This midnight blue jacket is another creation by Mary Lynn O’Shea, who is known for her sense of color. Nancy Jemio’s chenille sandhill crane sweater is a perennial favorite at the Atlanta show, says Shepherd. Shepherd treated herself to this crinkled silk jacket with bronze appliqués by Marcia Phillips when she won a gift certificate as a door prize at the ACC Atlanta show. This handwoven jacket by Deborah Cross was one of Shepherd’s early purchases. Its sleek lines and non-wrinkle fabric make it practical as well as elegant. Over the last twenty-odd years of attending the American Craft Council’s annual Atlanta show, Alana Shepherd has purchased turned wooden bowls and cutting boards, blown glass salt and pepper shakers, leather handbags, sterling silver utensils, whirligigs, and a giant papier-mâché clock shaped like a zebra head, its tongue wagging back and forth as the pendulum. But she really loves the jackets. 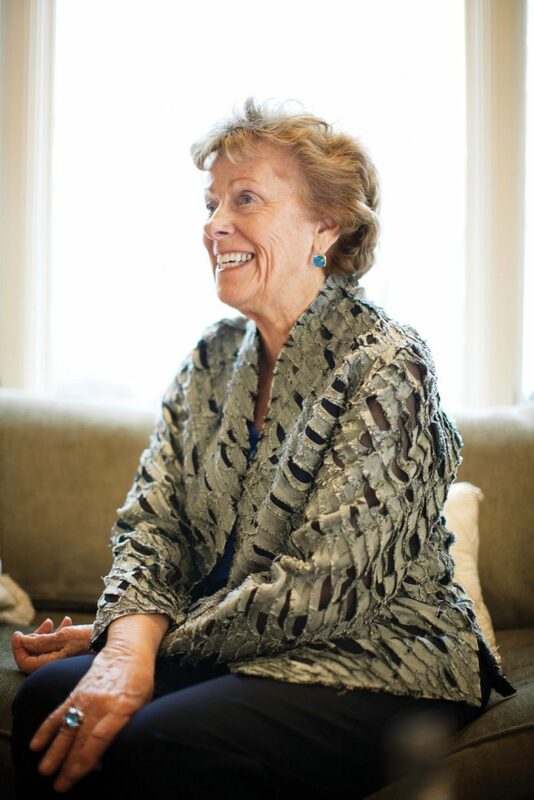 She has at least a half dozen that she wears daily to meetings, weddings, and charitable events—of which there are many, given her role as cofounder and trustee of Shepherd Center, one of the nation’s top rehabilitation hospitals. “I’m kind of crafty myself,” she confides. “I can sew.” In fact, she’s snapped up sewing machines at estate sales for her daughter, niece, and grandchildren and recently stitched up silk linen presses for her granddaughters. The ACC show, coming March 11 through 13 to the Cobb Galleria (with a preview party on March 10), has become something of an annual tradition for Shepherd and her friends. “We’ll see each other and say, ‘Oh, I love your jacket,’ knowing that we both have one,” she says with a laugh. Thanks to phenomena such as the website Etsy and Atlanta’s own Indie Craft Experience, handmade crafts are hip again. Last year’s Atlanta ACC show saw an uptick in attendance, spurred by a new children’s art component and publicity via Facebook and Scoutmob. The juried show includes more than 200 craft artists, many of whom are featured by top museums (see sample work below). But “handmade under $100” vendors and an AltCraft section for up-and-comers ensure plenty of affordable finds. “I enjoy seeing everything even if I don’t want to own it,” says Shepherd. “It’s just like going to a movie. It’s entertainment. Of course, you can go out and not buy one thing but be inspired to do something yourself.” But remember, this is from a woman who brought home a zebra. This article originally appeared in our March 2011 issue.